(Bloomberg) -- President Donald Trump emphasized his support for Israel days before what he forecast would be a “close” election there, and made the case for Jewish voters in the U.S. to abandon their traditional support for Democratic candidates in the next election cycle. “Under my administration the U.S. will always support Israel’s right to self defense,” Trump said on Saturday at a meeting of the Republican Jewish Coalition in Las Vegas. 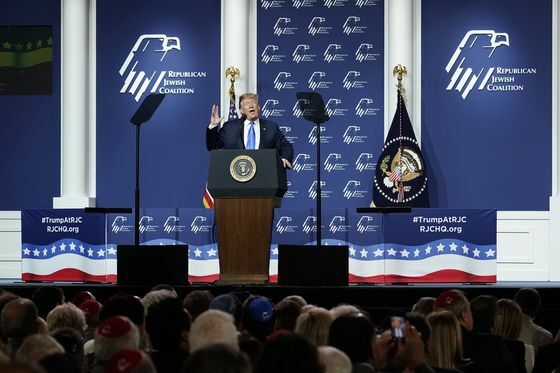 It was an hour-long, more Israel-focused version of his typical rally speech about the U.S. -Mexico border wall, the economy, the confirmation of conservative judges, partisan Democrats, and other topics. The RJC meeting took place at the Venetian Resort, owned by one of the best known donors to the group, Sheldon Adelson, billionaire founder of Las Vegas Sands Corp. Adelson, 85, has been battling non-Hodgkin’s lymphoma, and received a loud ovation when he appeared at the event and took a seat in the front row. The speech comes days before Tuesday’s vote in Israel in which Prime Minister Benjamin Netanyahu, a Trump ally, is seeking re-election. The Israeli leader has been dogged by corruption allegations. “I think it’s going to be close. Two good people,” Trump said of the race between Netanyahu and former Army Chief of Staff Benny Gantz. Trump has taken steps that provide a symbolic boost to Netanyahu, including recognizing Israeli sovereignty over the Golan Heights during the prime minister’s visit to Washington last month. Israeli captured the territory in 1967. The future of the plateau, a scenic area containing important water sources, had long been considered a subject for negotiation in any potential peace agreement with Syria. Trump has looked to display U.S. support for Israel in general, and for Netanyahu in particular, in various other ways, including moving the U.S. Embassy from Tel Aviv to Jerusalem in 2018 -- “I took an historic action,” Trump said Saturday -- and pulling out of the nuclear agreement his predecessor Barack Obama negotiated with Iran. On Saturday, Trump also noted that he removed the U.S. from the United Nations Human Rights Council because of that body’s opposition to some of Israel’s actions. The president told the audience of about 1,600, "I stood with your prime minister,” referring to Netanyahu and despite that they were mostly Jewish Americans. Several protesters from the group IfNotNow disrupted the start of Trump’s speech, chanting “Jews are here to say, occupation is a plague” -- a reference to the Golan Heights controversy -- before being ejected from the auditorium. In 2016, Jewish voters went for Hillary Clinton over Trump by 71 percent to 24 percent, according to records from the Jewish Virtual Library, a project of the American-Israel Cooperative Enterprise. The last time a Republican candidate won 40 percent or more of the Jewish vote was Dwight Eisenhower in 1956. Obama got 78 percent and 69 percent of the Jewish vote in his first and second terms. “How the hell did you support President Obama? How did you do it? How’d you do it?” Trump asked rhetorically before being reminded that the Jewish Republicans in the audience, including mega-donor Adelson, were among those what didn’t back the former president.